-Sitting on a comfortable couch, easy chairs or in the well pillowed window seat reading a book when you are not staring at the ocean view. -Sleeping well to the sounds of the surf from the spacious, well-appointed master bedroom. -Watching a Blu-ray video on the 40 inch flat screen Hi-Def TV in the sky lit family room, which is complete with a wet bar and a red, wood burning stove. Coffee table or tray tables make for easy snacking while watching a movie or game. -Enjoying the various original works of art throughout the house. -Picking images out of the natural stone, large fireplace while watching the flames from the wood fire. -Perusing the bookshelf which includes guides for stars, wildflowers, and sea life. -Scanning the free wi-fi internet for tide levels, restaurants, artists, local activities, etc. -Sipping a bit of bubbly on the deck. -Viewing brilliantly colored sunsets seen from all the front windows and deck. -Gazing at the unrivaled night sky ablaze with stars. -Soaking in the hot tub under the stars in the enclosed patio off the family room. -Working late into the night on one of the many puzzles. -Protecting your car from the elements in the attached garage. -Strolling along the bluff trail across the street while viewing the exciting wave action on the rugged gigantic rocks or the calm tide pools with a variety of sea life. -Observing wildlife: deer, quail, and more often wander across the yard. -Walking to the very large community swimming pool half a mile away (or drive, if you prefer). Two more interesting beaches worth exploring are adjacent to the Ohlson pool and rec area. -Looking at seals who quizzically stare back from their stone perches. -Seasonally, seeing the whale spouts progress across the almost 180 degree panorama of the Pacific. -Walking dramatic Shell Beach, a five minute drive. 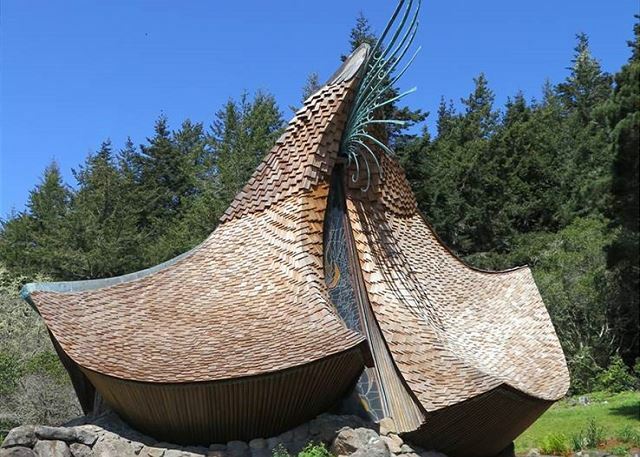 -Savoring the serenity of the Sea Ranch Chapel, a jewel box architectural gem five minutes from the house. Open every day. 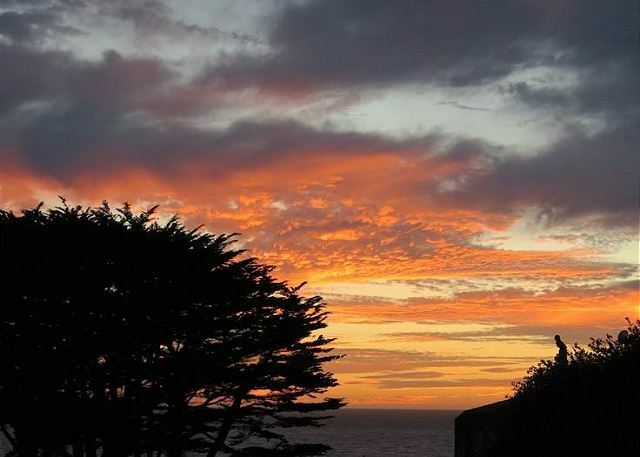 -Relishing wonderful dinners at St. Orres and the Sea Ranch Lodge with the savings you made by choosing to stay at Headlands Haven. House was clean, equipped with what we needed, good location, very comfortable stay! Jim M from Santa Rosa, ca does not recommend this vacation rental. We’ve stayed at various properties over the years and all of them have been good, including this home. This is not the fanciest home in Sea Ranch but it's my favorite. We liked the layout of the house. The windows were not clean on the outside. It hampered our view. If we go back I will be prepared. This spacious home has great amenities, including a great fireplace, very well-stocked kitchen and a therapeutic jacuzzi. Delightful. Private, quiet, well furnished though the house could use some updates re venetian blind cords, deck furniture, stove top burners and an oven temperature gage - perfect house for two people. It’s always nice to get away to the sea Ranch. My husband and I and our two dogs had a very nice stay here. All the basics were provided and we weren't lacking for anything. Lovely in spite of lots of rain. Great fireplace and plenty of wood. Everything I needed was available in the house. Lovely TV room separate from the living area was very well planned. Views were great. I will return. This house work well for a small group, and allows dogs, it is located in a wonderful place close to path and views are terrific.....but it needs tlc and we had some issues while we were there relating to maintenance. The rental company was responsive and the owner agreed to a reduction when the hot water stopped working. Hopefully at least some of these issues will be resolved shortly. We were pleasantly surprised by this lovely beach rental. The pictures don't really do it justice. A very short walk to the trails along the ocean, including a three minute walk to the seal-watching rocks. It was wonderful for our dog, who got many more walks than she does in the city! The fireplace in the living room was lovely and heats the house, including the kitchen. The kitchen was roomy and well stocked, but a few of the items could use some updating. We like to cook and some of the pans and baking sheets could be replaced cheaply. The glassware was hit and miss. These are minor complaints, and we are staying here again in a month. We will brings along some of the kitchen items we would like to have. As far as technically having everything you would need, it was certainly adequate. The view was outstanding, better than I expected and we actually booked an additional night; we didn't want to leave! We came from New York and Santa Fe, NM for 6 days in December. The house was extremely well appointed and comfortable, esp. the kitchen. It is very close to the rugged coast and hiking train, about a mile from tennis courts and pool, a walkable distance on the hiking trail. Beds were extremely comfortable, the grill worked well, the hot tub as well. We would definitley recommend this house to families and groups of six or less. This is a dog friendly house with terrific views. We have rented this house in the past and will continue to do so. Next year, we hope to extend our stay by a few days. The bluff trail is just across the street, offers north/south access and is very close to the seal viewing area. Bring binoculars since you can whale watch right from the window seat. We had a great stay, and the price was reasonable. 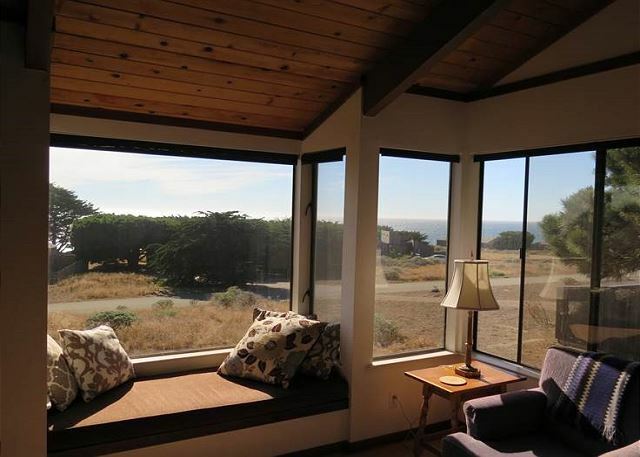 We would definitely reccomend this rental for anyone looking to stay at sea ranch. Chromatica, our Danville-based chorus, came to Sea Ranch for an intensive rehearsal weekend, using the Ohlson Ranch House as our rehearsal site. all the houses were great, including this one. many attendees had not been to Sea Ranch before and will certainly return. the rental agency was very responsive and helpful -- overall a great experience. Been renting at Sea Ranch for almost 30 years. This home had a great location and provided easy access to trails. The layout of the home was comfortable, amenities and home the hot tub were as or better than described and very clean. Kitchen was well stocked and we enjoyed preparing meals. The welcome gift for our dogs (not to mention a wonderful set-up) was a warm touch. Give them a 4 paws for the welcome at the management company too. Watching the views from the kitchen nook, the dining table the fantastic window seat, couch and a quick walk to the bluffs provided a relaxing haven and we look forward to a return trip! Very charming, comfortable house with amazing views, in the perfect location for long walks with our dog. We loved being so close to the coastal trail and the seals, and also had a great full day of walking down to the lodge, then up the forest trails to 2 Fish Bakery and back home. Saw whales from the trails (and the window seat) every day! We've been wanting to come to Sea Ranch for a long time, and this house had everything we needed for a perfect weekend with our pup. We will be back! the house was great for our family, only thing that I would improve on is the oven and making sure that there are candles in the house for power outages. We had rain hail sunshine and new beachline to explore. The fire was comforting while watching the storms roll in from the bench seat. We had very relaxing and enjoying weekend. Great, comfortable home in a great location. I'm grateful that they take dogs, as mine had a great time.We were two adults, two kids ages 5 and 10, and one corgi. The hot tub was perfect, and I loved the window seat with the view. There was plenty of firewood. The kitchen is small and outdated, but perfectly functional. We plan to stay here again. Great time. All 5's on report card. Could have used a pot to make soup. Would have like a garbage disposal . Overall really enjoyed it. We enjoyed the home and the layout was great for a group since there were multiple floors (in case you had early risers ??). The kitchen was a little dated, but fully functional and easy to use. There was easy access to walking trails and a seal observation area within a 5 minute walk. A lovely stay! House was very clean and comfortable. We went with our 1yo daughter, she loved exploring and they did have a baby gate in the master closet. This was necessary for the two stair cases in the house. Great layout at a good price! The weather was wonderful, the surf was fantastic and the rental was superb! 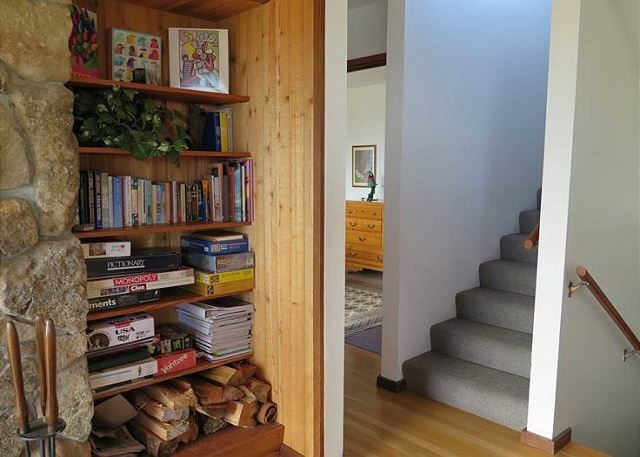 This property is perfect for a small family with a dog. The rooms feel so comfortable it was like coming home. The location was perfect being within walking distance of the ocean and recreational center. It was also close to the road but we never heard any traffic noise. We are looking forward to returning. However we had so much fun we want to bring friends with us next time so will have to stay in a different location. great house, pretty location. We were able to get two houses close together for a mini family reunion. Lots of close activities with pools, tennis, basketball etc. We were able to bike easily between the complexes. Kid and adult friendly. We loved the Wildlife the hiking trails and the serenity of Sea Ranch. The house was comfortable and we appreciated being able to take the dogs. I wish the beaches were easier to get to without hiking a mile, but we went further North and found one. I stayed here for a few days and was pleasantly surprised by the house. There was lots of space for me and family with bedrooms on separate floors. We made yummy meals in the kitchen, did puzzles and curled up in the window seat to watch the ocean. Great location, near trail head and nice ocean view, but not so close to the trail that you have people walking by your window. We had a very nice stay at this home. 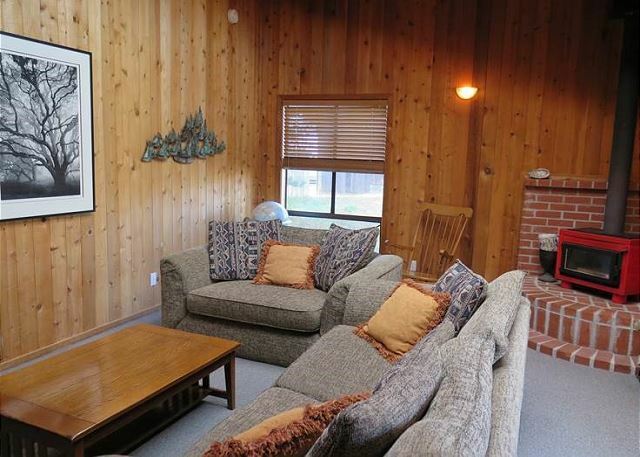 It is small and cozy, perfect for the 2 of us and close to bluff trails. It did rain most of the week we were there in March so we made cozy fires and played board games and read books. But we also dressed warm and hiked with our pups in the fog and mist. The hot tub needs to be updated and also some kitchen appliances, the toaster only half works and the stove really needs to be replaced. But overall this is a comfortable home for up to 4 people. A last minute escape to a gem! 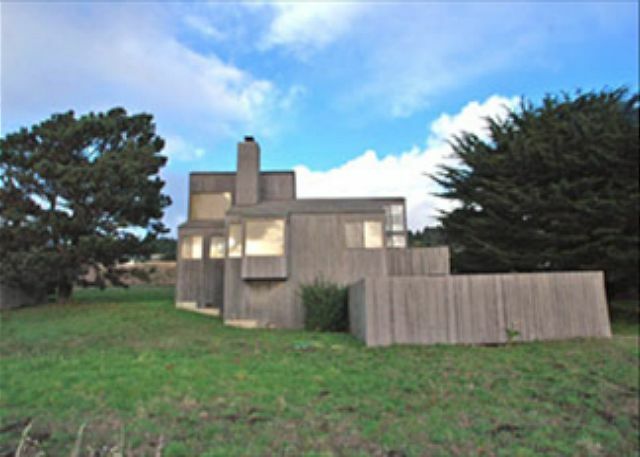 When I found we had a few days off, I booked this lovely home at Sea Ranch with Kathy at Beach Rentals who made the experience seamless. Headlands Haven is a wonderful, warm home with a cool design, and a beautiful fireplace, which we enjoyed day and night. There are great views and it's close to the water, so we slept comfortably listening to the ocean. I loved the window seat. And we had a blast in the hot tub in the rain. Off season and their generous offer of stay two nights, get the 3rd night free made this getaway affordable. I think we've started a new January tradition. We had a wonderful holiday getaway at Headlands Haven. The house is exceptionally comfortable with amazing views and close access to the cliff walk (less than a block). Cool evenings, warm fires, seal and whale watching, and cozy sunsets were just a few of the highlights of our trip. Very good! The property is in a very good location, near the bluff where one can have a great view of the seals and their pups. The sunsets are fantastic. Wide view of the ocean from the upper floors. Charming house with great decor. 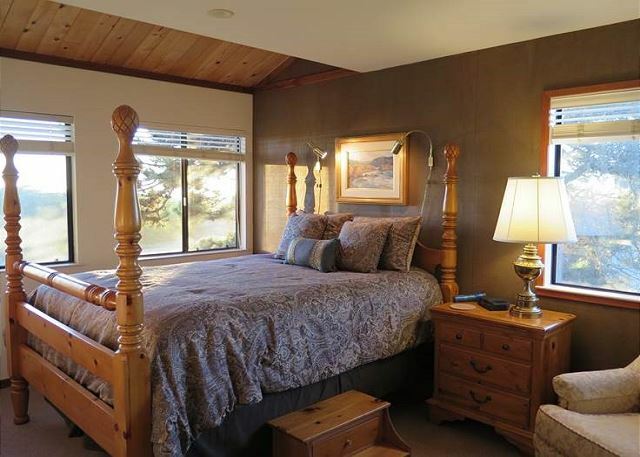 Conveniently close to the Sea Ranch Lodge and not too far away from Gualala. We had the most wonderful time at headlands heaven. The house is lovely and well appointed. The views are magical and you can happily sit and read int he window seat all day! experience better than the photos. A little small and no ensuite bathrooms is a drawback. Had a very relaxing weekend. Convenient location, short walk to cliffs, lots of local animals, nature walks, and easy side trips. Wish they had more up to date media-TV, ipod inputs, etc. Otherwise perfect spot. Very comfortable home. Wonderful fire place, close to the ocean, very functional home. Great hot tub, the TV wasn't the best, but who is up there to watch TV?!! Very close to the bluff trail and close to the area where the seals hang out. We had a great run on the trail and explored a lot. Love sea ranch and love this home. We'll be back. Oh and the bed in the main bedroom was very comfortable. We like this place a lot. Cozy, nice views and good location. 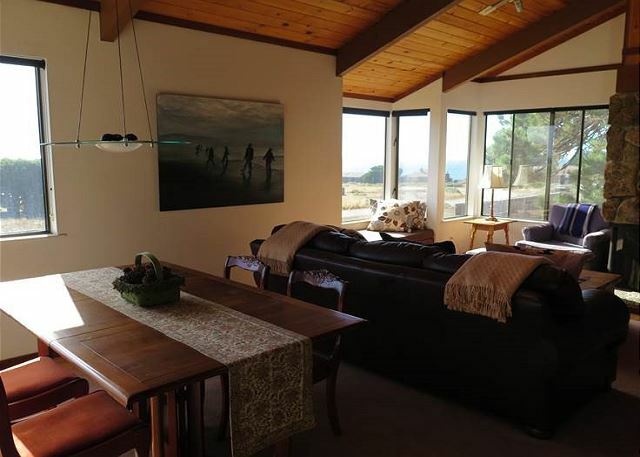 Very close to bluff trials and beaches, the house is just a short distance to harbor seal observation areas. The blue water views are wonderful as were the sunsets. A drawback is that the house is designed for tall people. At 5'3" I could only reach the first shelf of kitchen cabinets, and the first floor bedroom has the bed up on pillars so that I could not get in or out of the bed without the use of the one 2-step footstool in the house. Second bedroom upstairs had a bed I could reach, but the bathroom is on the first floor. This rental property was splendid. It allowed two guests as much together or alone time as we wished. The location was terrific, about 2 minutes from a trail along the coast. The house was a home: comfortable, unpretentious, perfectly equipped, with great views and any amenity we could have wanted. The rental agency was great to work with in making arrangements, and they made the house totally welcoming, down to arranging kindling and firewood in the fireplace and separate woodstove. The cupboard contains just about any herb or spice a cook might desire. Kelly L from Truckee, CA does not recommend this vacation rental. Sea Ranch is always lovely no matter where you stay and Beach Rentals is very courteous and professional. Headlands Haven is a quirky old home that has been well maintained. The only issue we had is that we love to cook and the kitchen is not well suited to cooking gourmet meals. Being on the short side (5'2") I could not reach the upper second shelves for coffee cups or small plates. If you don't cook and eat out, this home will work just fine, otherwise I'd would look for a different home. The mattress in the bedroom could be updated as it sinks in the middle and I was not able to get a good night's rest. We've stayed at many houses in Sea Ranch over the years and found this house when we wanted to take our dogs with us. This house isn't fancy and maybe that's the best part - it just feels calmly comfortable. It has great energy, amazing views, a simple kitchen, and enough room for our 14 year old son and our two dogs. We stayed in this home three times in 9 months, and we've never done that at any other house in Sea Ranch. A couple of things that may make us decide on a different home next time: The stove is getting really old and the main burner doesn't sit level at all. We cook all our meals while we are there and this gets a little old. (Plus if you use the exhaust fan in the kitchen, you'll wonder if something is going to come loose and fly across the room!) The second item is that the bed on the main floor is really hard. The bed in the upstairs room is much softer, but the bathroom is on the main floor. This last time we hauled up 1" memory foam to see if it would help, and it only helped a little (and took up a ton of our car space). If you're okay walking down the stairs in the night to use the bathroom, I suggest you place dibs on that upstairs bed unless you prefer a very firm mattress. Overall, this place is an unassuming gem where you can spend quiet time staring at the ocean in a very private setting, with your pups settled in front of the fire. We love the puzzles and books, too, and have even watched an old video tape on the ancient tv set-up! We really enjoyed it. Great ocean views, especially from the the loft. Loved the sound of the sea lions and watching them raft. We saw the seals nearby lounging on the rocks at the Reserve. We saw whale spouts from the window seat and dining room area. The loft felt like its own apartment according to our 15 year old. It was nice lying in the four poster bed and simply turning our heads t see the view out the window. The toaster and oven need a bit of an upgrade. The deck is nice but small and needs a table. Great house for a family of four and a small dog. Kitchen was equipped with everything to cook meals. Very cozy home. Hot tub was a nice amenity. Great location to rec centers and beach trail. This is perfect for a family of 4. We had ample space, loved that the TV was not part of the main room, and we were steps away from the Bluff Trail. You do need to plan on a hike to the nearest beach, but the tidepools and seal observation are right there. The house was very clean and the kitchen very well stocked with cooking utensils. Gorgeous views from the living room, kitchen and both bedrooms. The beds were very comfortable, too. Private hot tub was a staple every morning and evening. It's also nice that doors do not open directly to trail or street for children's safety. What a lovely home and location! Saw a bobcat, deer, and large jackrabbits! The marine reserve enabled us to see seals. My husband caught some delicious fish off the cliffs for dinner one night! The window seat in the living room was a coveted spot for relaxing. What a nice view, and to hear the tide was heavenly! The hot tub under the stars was so relaxing... Also....we had no problem being "home bound" here when my car unexpectedly needed repairs in Gualala. Lovely people, and they fixed it just in time for us to check out. We WILL be back again!!! We have rented Headlands Haven a number of time and have enjoyed each visit. This year we were pleased to see several new amenities, including a new coffee maker and some new utensils in the kitchen, several new pieces of artwork, and a new handrail on the bottom steps in the yard--much appreciated! 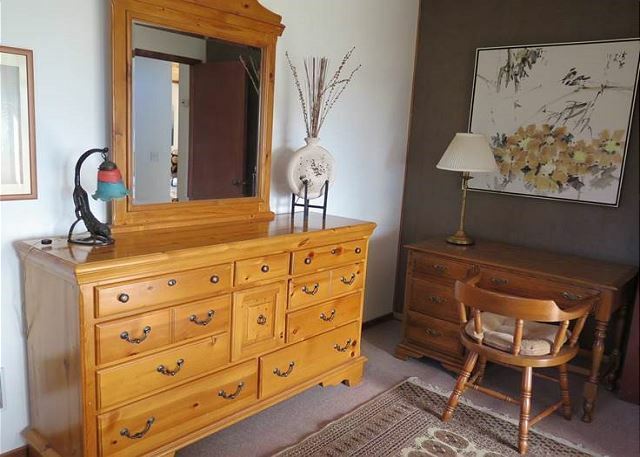 The location is great, close to the marine reserve and bluff trails to the beaches. Before our visit last year, the exterior of the house was painted, very nice. The interior of the breakfast nook area does need to be painted. We missed the old trestle table in the dining room, but it now serves as a nice laundry folding table in the garage. All in all, a wonderful stay in a very pleasant home. Wonderful and quiet getaway. Just what the doctor ordered for a couple of city boys. Headlands Haven was well appointed without being too fussy. Homey feel with basic amenities and more. Explored the trails in the morning and fell asleep to the sound of the ocean at night. H(e)aven! 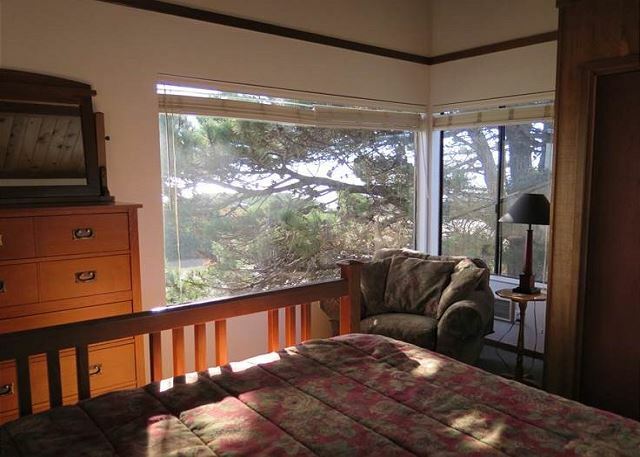 Ours was not a vacation, but a 30 day wait until our own home closed escrow in The Sea Ranch. Overall, Headlands Haven was a wonderful location with views and more views. It was well equipped and cozy. Only 2 issues - the TV was a very old Sony CRT - but then we weren't there to watch TV! Also, the LR windows were very dirty. In early morning and evening hours they were hard to see out of. But, all we had to do was head out to the wonderful deck off the kitchen for the best view around. We had our 2 dogs with us and they loved it also. Deer would come right up to the house. We also saw a bobcat and giant jack rabbits. All in all a wonderful stay at Headlands. A great way to spend a birthday weekend. Perfect weather, perfect location, perfect house. The staff was very professional and helpful when I called long distance from San Diego. We loved the views; the home was very comfortable for us. Only one complaint: the only bath tub/shower in the home drained very poorly and slowly. We take water conservative showers, shutting off the water while soaping up, etc., but the water was ankle deep most of the time. Excellent views and location! It is a dog friendly home so there is a stray dog hair here and there. Kitchen is ok bit not made for "foodies." We have been to Headland Haven a number of times. We especially like the location and it is more than adequate for 2 people. We know we can always expect a quiet, restful vacation. We spent some real good quality time with the kids, walking, playing games, and enjoying the amenities of the ranch. This property is close to hiking trails, a secluded sandy beach, a sea lion preserve… and a tide poolers dream. What a location! A short drive away was a swimming pool, tennis courts and a basketball court. Add in animals galore and beautiful sunsets and WoW what a great time! Had a great time with adult kids and our dog - easy walk to beach and great view of sunsets and pelicans flying by. Lots of puzzles and easy to cook and clean up. This was our second stay here and it remains an ideal spot for our family. My personal favorite spot is in the window seat. My only complaint is the wall heaters not being very efficient in warming the common areas. Mornings are very cold for that reason and for comfort usually need heaters going thru the day. Aside from that we love the location and proximity of the great trails, to Gualala, and to Two Fishes bakery! We'll be back. Everything was ready for our arrival--heat, lights and even hot tub. Very relaxing and totally enjoyable. Relaxing weekend spent walking around sea ranch and in the hot tub. The house is in a wonderful location and the windows have fantastic views of the ocean. The small enclosed garden with hot tub is great if you have a dog. Great location to the trails and Marine Preserve. Headlands Haven was a delightful home. Great views, awesome access to beach ridge trails with seals lolling about nearby. I had a great time and plan to return same time next year! Great place to vacation. Lovely walking trails, very relaxing. This place is our new favorite and is great for families. My husband and I were able to sit on the couch with a fire in the fireplace our dog at our side while enjoying the ocean views. We had great weather so the sunsets were amazing. The place is very close to the harbor seal sunning rocks and the tide pools. Our children had a wonderful time exploring nature (we were able to teach them about conservation). We really liked walks in the fresh air along the bluff of the beautiful California Coast. Headlands Heaven was perfect for our family and it felt like home. I have been to Sea Ranch twice per year for the last 3 years and this was one of the cleanest house we've rented(not even one cobweb). Thank you...Management was extremely helpful and even shipped a large item that we accidentely left behind...Thank you that was so kind of you to take the the time to package it so nicely...Having the right management company makes all the difference. The house was great with wonderful views. The weather was very windy everyday that we were there after about 9:30 AM.